This morning we had breakfast in the hotel room before heading to the airport. We had a short one hour flight to Izmir and then met our new guide at the airport. We could not have lucked out more with a more experienced, kind and gracious guide. He is absolutely fantastic! 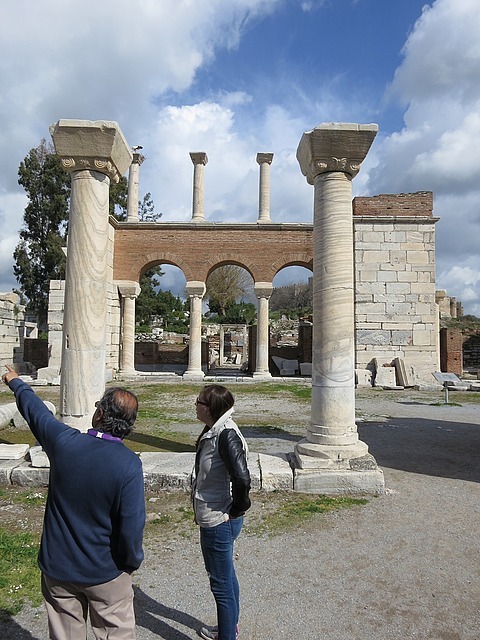 Bulent is an archaeologist and has worked on all the Ephesus sites we visited today and will visit tomorrow. It is so fascinating to hear about all the information from someone who has firsthand worked on the excavation of the areas. 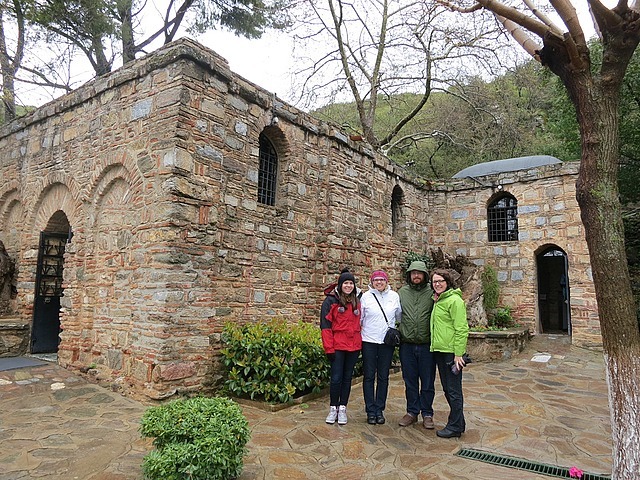 We drove from Izmir for about an hour and first visited the house where The Blessed Virgin Mary has been said to have lived her last years. The foundation of the home was still in tact but they rebuilt a structure on the site. The Vatican recognizes this as her last home and most popes come to visit. There were three faucets you could wash or drink from; one for wealth, one for health and one for happiness. We all took some sips and hoped for the best! 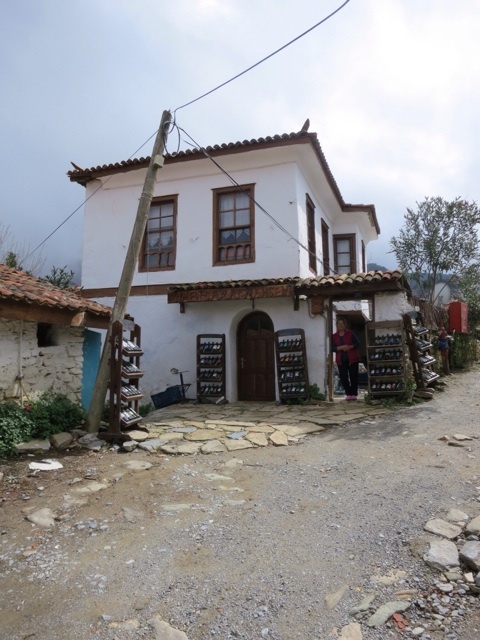 After we visited Mary's house we went to the small village of Sirince (I can't put the correct accents on it, but it's a very tiny village of about 400 people and also where we are staying tonight and tomorrow). 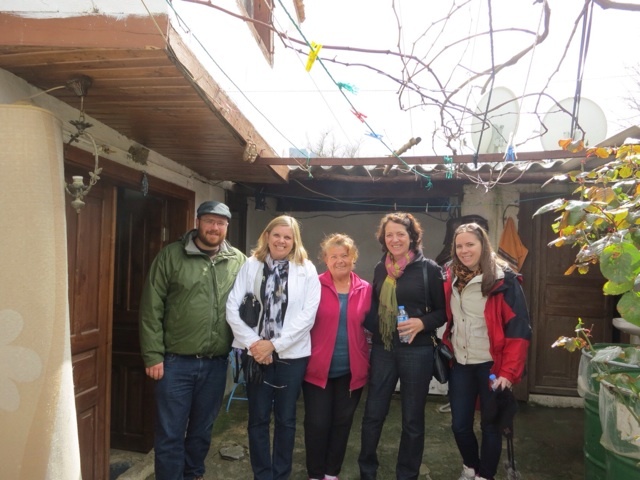 We had lunch at a local woman's home and had traditional Turkish cuisine. It was Dan's favorite meal so far and was delicious. She had a huge spread of mezes, main courses and a rice pudding for dessert. The travel company had told her that we had children on the tour so she had purchased some coke and boy was I happy she did because when we had the local wine but I personally thought it wasn't very good. 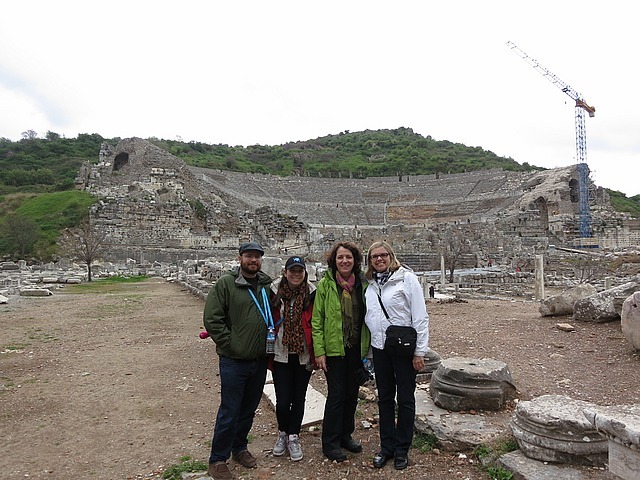 After lunch we headed to Ephesus and it's hard to put into words how fascinating it is! 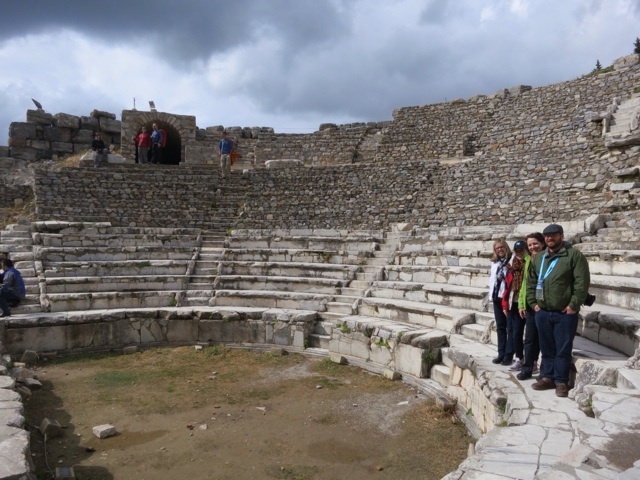 We learned SO MUCH information from Bulent and he told us intriguing stories of his days excavating different areas. He has been working at Ephesus on and off for over 30 years! 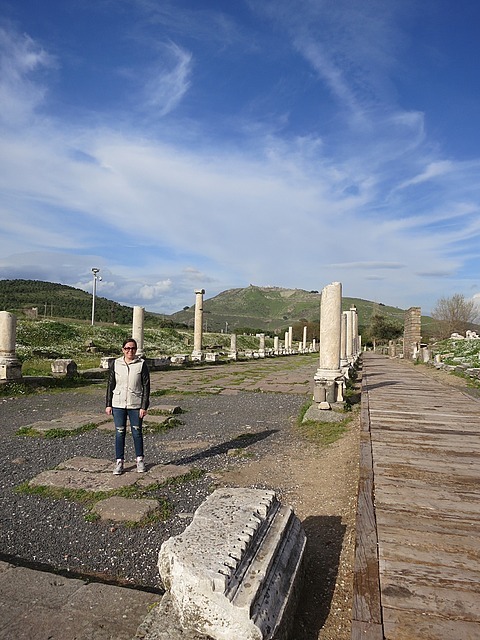 Ephesus had a population of over 250,000 people in the 1st century A.D.! The architecture, infrastructure and history is more impressive than I can put into words. 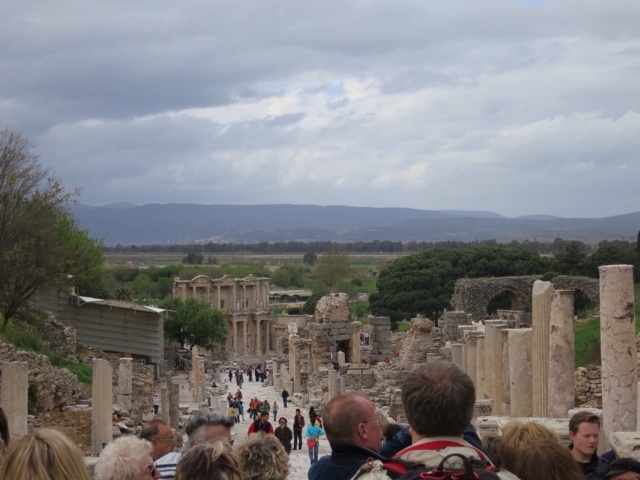 Only 10% of Ephesus is seen today and yet its size is still overwhelming. 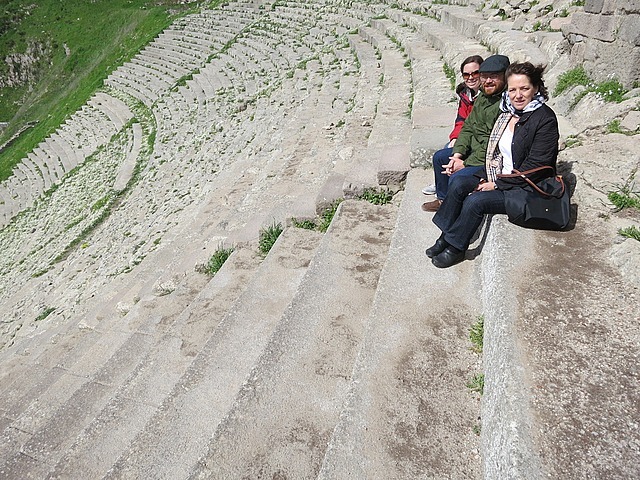 Can you imagine 30,000 people sitting in a theater 2,000 years ago?? We toured for about three hours and then headed to our hotel. I was a bit nervous because after today's lunch he said that we would be staying in a similar village style home. The house for lunch was...let's just say, not somewhere I'd want to be spending the night. However, Bulent totally undersold this place and it's gorgeous. 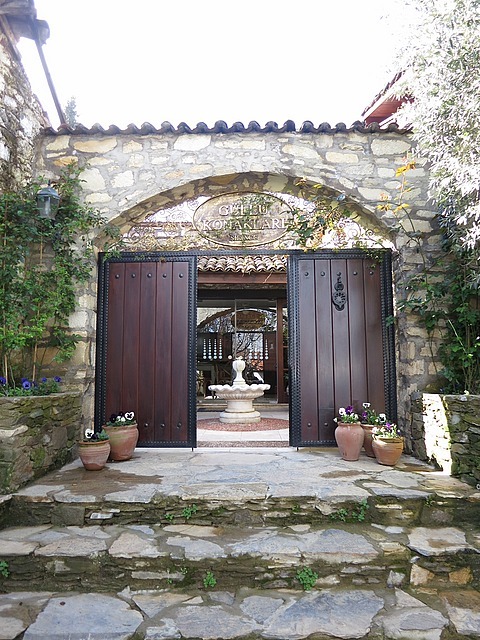 It feels like we have escaped to a villa in Napa Valley surrounded by olive trees and gardens galore. We had a lovely dinner in the shared main house and then Pat, Dan and I went in to check out the night life in the village. The "night life" consisted of two open things, both bars, one inside and one outside. We opted for the outside one and found ourselves cheering along with the locals watching a Turkish soccer game. 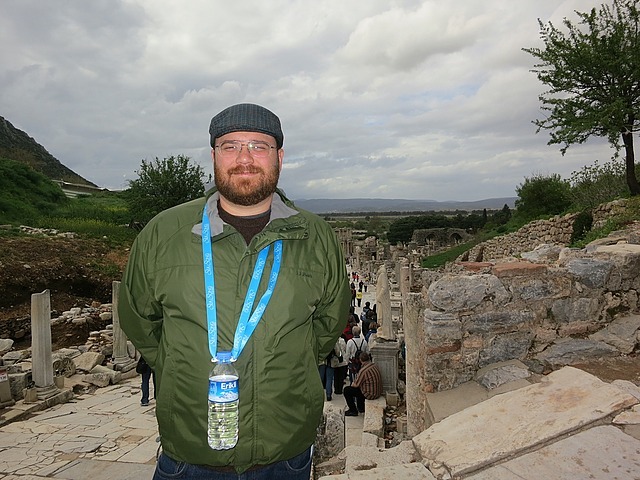 We are still loving the Efes beer and hope I can find it in the city. Early day tomorrow as we drive about two hours to see another ancient city and the first known psychiatric hospital. We had to be up early to begin our second day with Bulent. Little did we know yesterday but he is really the guide to the stars!! He has given tours to Pope Benedict, Mel Gibson and even Oprah to name a few! We had a huge spread for breakfast: olives, cheeses, jams, breads, eggs...I was definitely full and ready for the day! 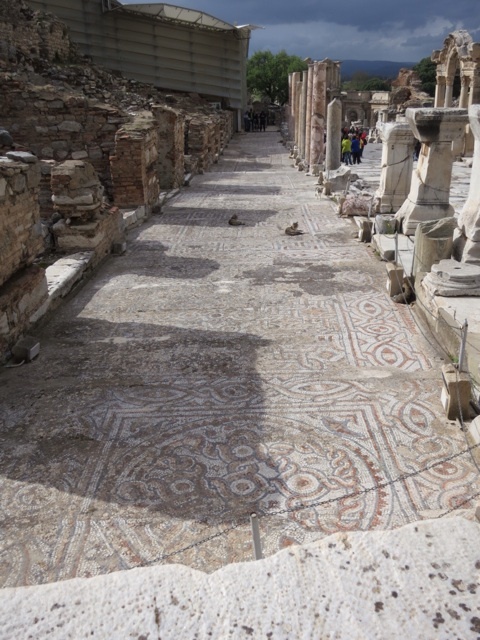 Our first stop wasn't far from Ephesus and was the Basilica of Saint John the Evangelist. 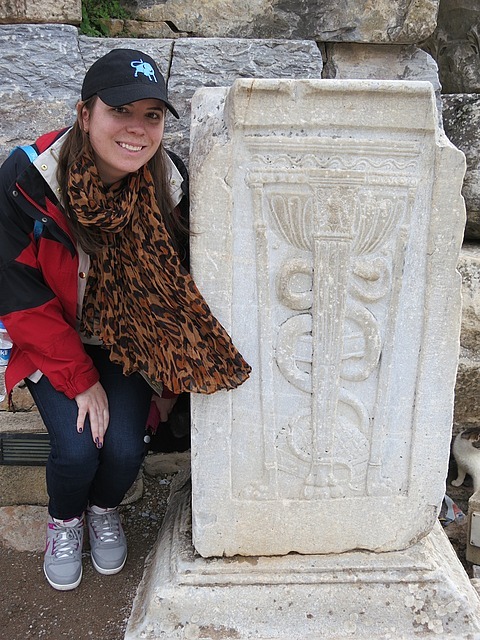 It was so cool to see a baptismal pool that still had the stairs in tact from over 1,500 years ago! The church was a cross shape was very large in size. The church was a short stop because we had a journey ahead of us! 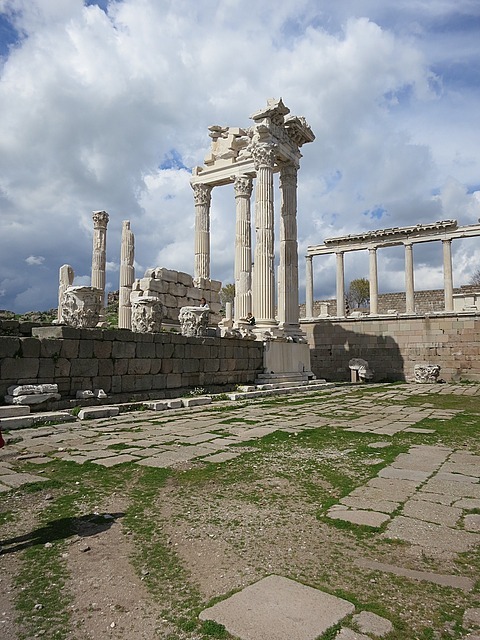 The itinerary said that Pergamon was 1.5 hours away but in reality I think it was closer to 2.5. We didn't know much about it ahead of time so we were all a bit weary of where we were going and how much we would really see. Let's just say the trip was more than worth it and I will never forget the views form the top of mountain! 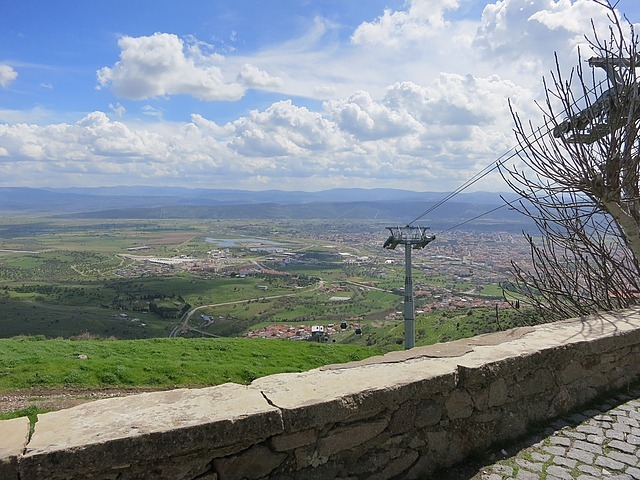 You could see for miles and it was apparent why the royal family would choose to build their palace on top of this mountain as the people of the city all lived below. Bulent has worked on this site as well over the last 30 years and had so many great tidbits of information and stories to tell. 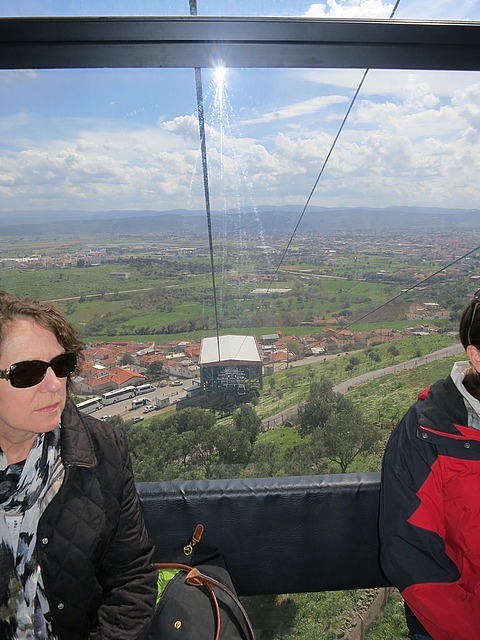 We rode a gondola to the top and started the trek through palace. Today was not for the weary and I'm sure mom will be icing her knee heavily tonight. We did lots of climbing up and down stairs and in and out of tunnels and passageways. Back to Oprah for a quick sec...when she came here, she sat and waited near the top of the gondola because she was too out of shape to walk it. I can't imagine traveling all the way here and not exploring! Boy, did she miss out! 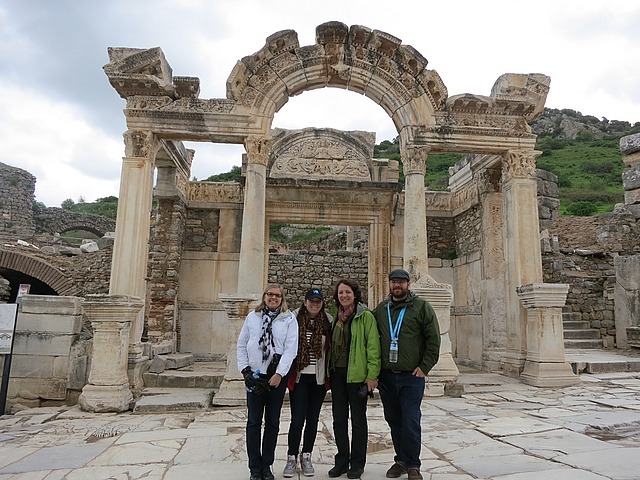 We saw the ruins of a library that used to hold over 250,000 books (scrolls), incredible archways to support the structures above, and the steepest theater that could seat over 7,000. As Bulent would explain the origins of so many words today, we would all in unison say, "ahhh" or "ohh, that makes sense". He has been professor of anthropology and archaeology and I'm sure he would've been my favorite professor! 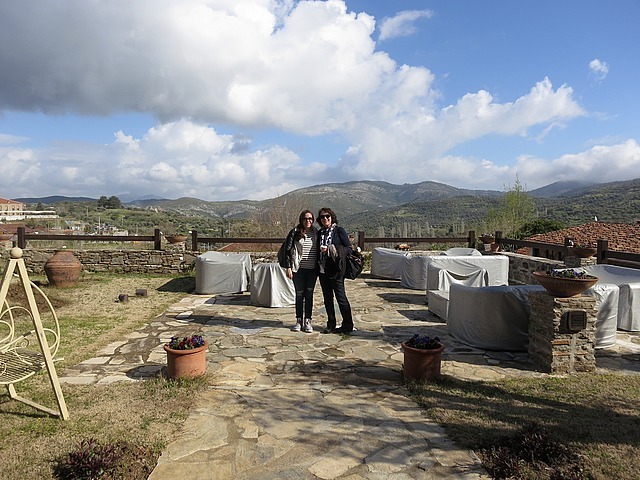 We had lunch and then visited the Asklepion which is one of the oldest hospitals in the world and the first known place to treat mental health. The place actually sounded like fun, even though it may have been full of crazy people. They got massages, watched theater, had mud baths, among other fascinating treatments. All of the measures they went to to diagnose and treat the people was incredible and seems to be much more than is done today. A common theme that we kept hearing about yesterday and today when we would ask if something was original, he would tell us that part is in the Berlin museum from when they took it over 120 years ago during excavation. Come on, Berlin, give it back so they can put back together their history! We have one more night in Sirince then head back to Istanbul tomorrow for one night then back to Saudi for Dan and NYC for us.